THE curtain comes down on the flat season at Ayr Racecourse this Saturday 30 October with the John Smith’s Raceday, which is also Ayr’s last Saturday meeting of 2010. 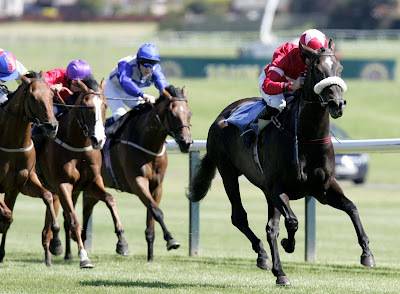 And in addition to the seven race card there will be presentations to the leading owner, trainer and jockey at Ayr for the 2010 flat season, with Jim Goldie and Paul Hanagan looking certain to be crowned top trainer and top jockey, while the owner’s championship is wide open. Saturday’s card is due off at 2.10pm with the European Breeders’ Fund Maiden Stakes over seven furlongs, a race in which Irish trainer Liam McAteer has booked up-and-coming jockey Andrea Atzeni to ride Crowned Supreme. The aforementioned Jim Goldie will have several runners throughout the afternoon, and it could pay to be on Pokfulham in the last race on the card, the Plumbstore Ltd Handicap. Another trainer with plenty of runners will be Linda Perratt, and her temperamental but talented sprinter The Bear could go close in the Advance Construction Handicap at 3.20pm. And the feature race of the afternoon, The John Smith's No Nonsense Handicap looks a tight affair with Richard Fahey’s Arabian Spirit, Alan Swinbank’s Oneofapear and Jeremy Glover’s Thunderball all in with chances. For more information go online on www.ayr-racecourse.co.uk or call 01292 264179. For further information please contact Iain Ferguson on 07795 565691. There are currently 792 Ayrshire business stories permanently archived on this site. To locate those of most interest to you, please use the site search facility in the top left hand corner of this page. Type your search term in the white box, then click the magnifying glass symbol.